I brought the Oreo Pie to our friend’s Labor Day cookout and between the 4 of us, we couldn’t even finish an 1/8 of it because of its richness, so I brought it to the office to share with my coworkers. I sent an email to the office saying the pie was in the fridge at 8 am, and by the time I went to get my lunch from the fridge at noon, the pie was almost gone except for a little sliver. I’m pretty sure that was a sign it was well-liked among my non-vegan colleagues. This easy-to-make dessert is so absolutely delicious that I’ll be making it again for the next party. 1. Preheat the oven to 400 F. Lightly oil a 9″ pie plate and set aside. 2. Mash the Oreo cookies either with a potato masher in a bowl or with a rolling pin with the cookies in a Ziplock baggie. Mash the cookies until they resemble very fine crumbs. 3. Transfer the crumbs to a mixing bowl and combine with the melted dairy-free soy margarine and sugar until well blended. 4. Press into the prepared pie plate and bake for about 10 minutes, or until evenly browned. 1. 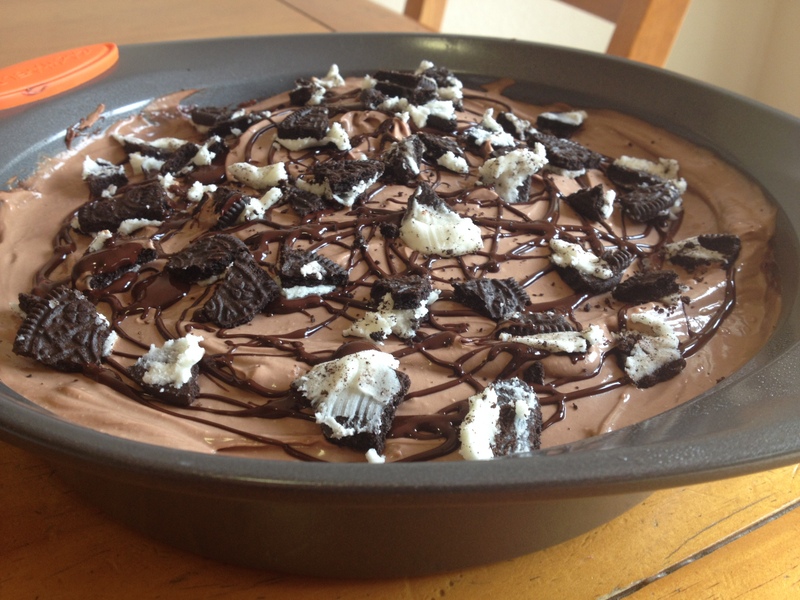 Prepare the Dairy-Free Oreo Pie Crust according to the recipe. 2. Prepare the filling. In a large mixing bowl, beat the dairy-free cream cheese until smooth. Gradually add the powdered sugar, beating until well combined. Add the melted dark dairy-free chocolate, beating until smooth. 3. Spread half of the mixture on top of the prepared crust in an even layer. Add the dairy-free sour cream to the remaining chocolate mixture and beat until well combined and fluffy. Spread on top of the chocolate layer, smoothing the top with an offset spatula. 4. If desired, using a spoon or knife, swirl 1-2 T. of dark dairy-free chocolate in pinwheels around the top of the pie. Crush a few dairy-free chocolate wafer cookies and sprinkle on top for extra decoration. Chill the pie for 2 hours or until set. Serve cold or frozen. This recipe is from About.com. This was SO GOOD, Alison!